It’s time to upgrade your old cleaner with the best cold water pressure washer in the market today. Check out our guide, plus reviews to get started! If you are thinking of buying your first cold water pressure washer or simply want to upgrade your old unit, then you must not skip this guide. Because a lot of people regret not reading reviews and guides before making the final purchase. Most of them reported that they got the wrong pressure washer for the job. Here, I listed down the things that you need to take note of when buying a cold water pressure washer. Also, I included the 5 top rated cold water pressure washer selections. Feeling lazy to scroll down the list? Here’s a quick table comparison of the 5 best cold water pressure washers! Want to know more recommended gas-powered pressure washers? Check the full list here. The PSI and GPM levels are very important considerations when buying a pressure washer. These two will help you determine the maximum cleaning power of the pressure washing machine. As you already know, the higher the cleaning power, the more powerful and efficient the performance will be. So, if you plan to use the pressure washer for medium to heavy-duty tasks, might as well get a unit with the maximum cleaning power of 6,000 CUs or higher. Of course, you also have to consider the cleaning tasks at hand. Many people encounter problems because they are using the wrong pressure washer for the job. Cold water pressure washers are perfect for household cleaning but not for areas where oil and grease are present. The hot water pressure washer vs cold washer argument applies here. You are better off with a hot water pressure washer if you are dealing with oil and grease. Also, keep in mind that fragile surfaces like glass, wood, or tile should be cleaned using a low-pressure cleaner with the wide-angle or soap nozzle. These surfaces can easily get damaged when a high-pressure unit or a turbo nozzle is used. Because pressure washer brands are sprouting everywhere these days, it’s difficult to distinguish the genuine units from the fake ones. To make sure you got yourself a good pressure washer, it is better to just stick to trusted brands who have undergone certifications and product tests. Look for machines that are EPA, CARB, CSA, or PWMA certified. To know the 10 trusted pressure washer brands, click here! This is very important for those who have children or even pets at home. Although you can take safety precautions on your own like storing the unit properly and using the right accessories, it is still advisable to look for cold water pressure washers with built-in safety features. To avoid electric shocks (for electric units), get a cleaner with a GFCI power cord. This is a fast-acting circuit breaker that shuts off the power automatically when a ground fault is detected. Furthermore, a spray gun with a safety lock is a must, especially if you are the forgetful type and always leave the unit running around children. A cold pressure washer with Total Stop System (TSS) would be great although the TSS feature is usually found in electric units only. For gas-powered cleaners, look for a welded steel frame, pneumatic wheels, and good engine and pump placement. Make sure that the engine and the pump are securely attached to the frame to protect them from the strong impact during application. Excited to get to know the best cold water pressure washers? Simpson Cleaning has always been one of the most trusted brands of power tools and outdoor equipment. Most of their power equipment such as pressure washers are known for their commercial and industrial uses. However, the brand also takes pride in producing high-quality cleaners for residential use. 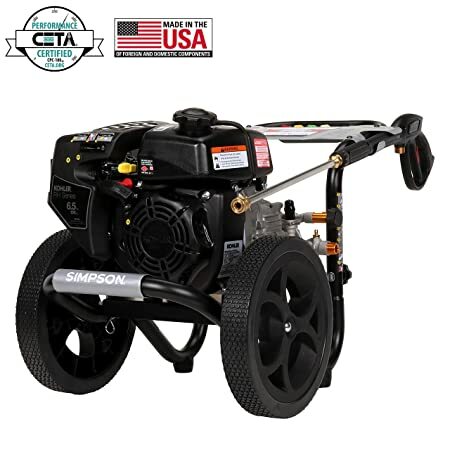 Just like the MS60763 MegaShot cold water pressure washer, Simpson Cleaning’s best cold water pressure washer for sale that is suitable for home use. It has 3000 PSI and 2.4 GPM flow rate, thus giving you a total cleaning power of 7,200 CUs. It has a Kohler RH265 premium engine; this engine is recommended for residential use. Simpson Cleaning MS60763 also makes use of OEM technologies axial cam pump, one of the best pumps for both hot and cold water pressure washers. With a welded steel frame construction to protect the engine when in use. The frame also includes a handle to make it easier to push the cold water pressure washer anywhere. Also, the steel frame is powder coated for added protection against corrosion. Of course, as part of Simpson Cleaning guarantees, you can assure that the machine is 100% tested safe and functional. To top it all, it also includes a MorFlex pressure washer hose that is kink- and abrasion resistant. The hose allows nozzle attachment; it can hold 5 different spray nozzles. The 12-inches never-flat wheels can support the entire weight of the unit, thus giving great stability. In terms of warranty program, Simpson Cleaning offers a 2-year limited warranty for the Kohler engine, 1-year warranty for the pump, 5-year warranty for the frame, and another 90-day for the pressure washer accessories. The warranty for the Kohler engine is for consumer use only. The hose is only 25-feet though. This Simpson cold water pressure washer unit is big and bulky. Users of this cold water pressure washer love this unit because of its powerful Honda engine. 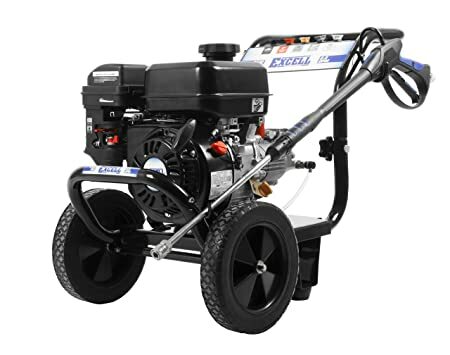 Excell pressure washers are also famous for being durable and sturdy. If you may have noticed, the unit is also supported by a steel frame with ergonomic design. 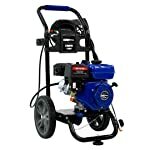 This Honda cold water pressure washer works great for both residential and commercial use. It has a total PSI of 3100 and a GPM of 2.8. This makes use of a 212cc engine that is compatible with the 8,680 CUs maximum cleaning power. The ergonomic wand is also rust-resistant. Its pump is also axial style with stainless steel pistons and a brass head. It has a low profile steel frame to allow easy storage in small spaces like under your workbench. The machine also comes with a pressure washer wand, which you can attach 5 different quick-connect nozzles. The onboard hose storage is also a plus so that you can keep the pressure washer hose and hang it neatly on the side. Maneuverability is also not an issue with this pressure washer unit; it has 10-inches never-flat tires, thus makes using the unit on any terrains possible. For the warranty, you’ll have a 2-year warranty for residential use and 90-days for commercial use. The 90-day warranty for commercial use it too short. The cold water pressure washer hose is only 25 feet long. The wand is also a bit short as compared to the other wand in the market. The muffler placement is a bit odd; it’s near the area where you attach the hose. Therefore, there is the tendency that you’ll burn yourself if you are not careful. WEN is another well-known power tools brands. The brand sells a variety of products, from hand tools to power equipment like cold water pressure washers. 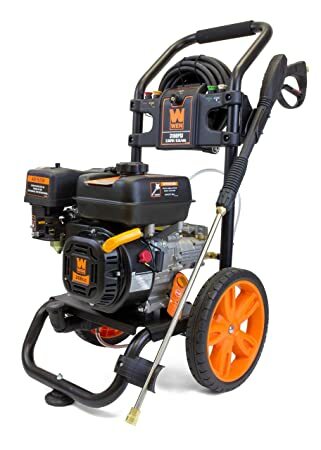 In most gas cold water pressure washer reviews, WEN PW31 has maintained a good standing. People love how compact the design is and the fact that it performs well. It has a total pressure of 3100 PSI and 2.5 GPM flow rate, for a total cleaning power of 7,750 CUs. If you want a petrol cold water pressure washer that you can easily store even in small spaces yet has powerful performance, then WEN PW31 is a great option. This is a beginner-friendly unit, as it is easy to use. The OHV engine is a 208 CC 4-stroke engine, which is a great fuel saver. Its engine also has great torque and very durable. WEN PW31 has 12-inches never-go-flat wheels that help you transport the unit on any tough terrains. Also, it is worth noting that its wheels are pneumatic wheels, perfect for uneven terrains. The wand that comes with this cold water pressure washer for sale is really comfortable. You can also start this machine easily and quietly. It has some pressure washer accessories like wand, lance, nozzles, and hose. This one also has onboard nozzle storage, as well as 5 different nozzle tips: 0, 15, 25, 40, and soap nozzle. The soap nozzle is perfect for cleaning the RVs, ATVs, cars, and even boats. This can’t handle oil and grease, as well as old stains. The pressure washer hose is only 30 feet long. 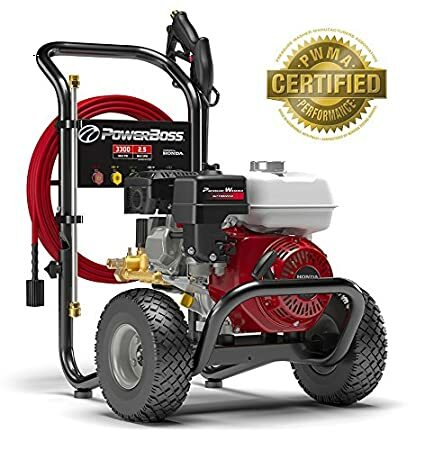 PowerBoss is a cold water pressure washer brand that is certified by PWMA or the Pressure Washer Manufacturer’s Association. So, if you are a bit picky with your purchase, especially since it’s a power tool, you should stick to tested and reliable brands such as PowerBoss. This 2800 PSI cold water pressure washer is considered as the best commercial cold water pressure washer by many for a reason. For one, it has a maximum cleaning power of 8,250 CUs, perfect for small business and other ventures. 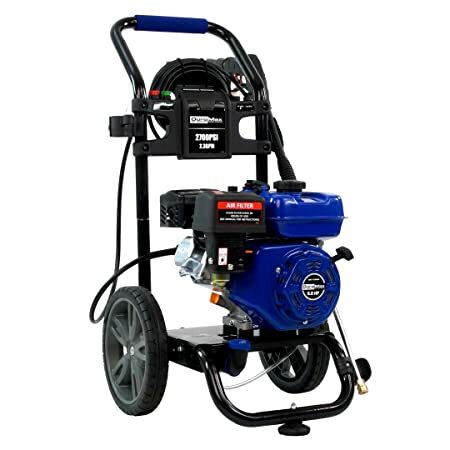 PowerBoss 2800 PSI cold water pressure washer’s key-selling feature is its Triplex pump and Honda engine. The triplex pump is known to have durable lifespan while the Honda GX200 is designed to handle medium to heavy-duty pressure washer applications. The pump also has adjustable pressure, so you can adjust the pressure from 300 to 3300 PSI. Comes with 5 quick-connect nozzle tips: 0, 15, 25, 40, and soap nozzles. Its EASTFlex cold water pressure washer hose is very flexible. Hence, it doesn’t get damaged easily if being stepped on several times. The unit also has a downstream detergent injector, which is great for a cold water pressure washer. It also has an ergonomic handle, which reduces the possibility of experiencing backache and back pains. Ideal for cleaning the siding, fence, deck, and patio. The number one downside of this product is its short warranty program. It only has 24 months warranty for consumer use and 3 months for commercial use. DuroMax is yet another impressive gas powered cold water pressure washer in the market recently. And there are amazing reasons for that. For one, DuroMax XP2700PWS Cold Water Pressure Washer is equipped with great features, accessories, and design. Many people love its space-saving structure and the fact that it has features that you won’t find in other cold water pressure washers. In addition, DuroMax’ pressure washer machines undergo testing and certification, so you can put your mind at ease about the product’s safety background. It makes use of DuroMax 5 HP engine, which is powerful and can handle medium-duty cleaning tasks. What makes this cold water unique is that it has a low oil shutdown system, which turns off the pump when it detects low oil level. This feature helps to protect the pump’s life. Also, the spray gun that comes with this unit has a safety switch, making it safe to use around children. Has a compact design, making it easier to store even in small spaces. There is also onboard storage for the high-pressure hose, spray gun, and even the nozzle tips. Its frame looks durable; it is welded and made from steel. Perfect for driveways, patios, fences, decks, and even on sidings. This is also EPA and CARB compliant, which means that the product is safe for the environment since it doesn’t emit harmful gas or fumes. It is only offered with a 1-year limited factory warranty, although it has a 30-day satisfaction guarantee program. Choosing the best cold water pressure washer can be a headache, especially if you don’t know what to look for. But hopefully, after reading the short guide and reviews, you are now two steps closer to choosing the pressure washer for your needs. Among the 5 products on the list, I recommend the DuroMax XP2700PWS Cold Water Pressure Washer. It has ticked almost all the things that you should look for in a pressure washer. This offers great cleaning power, cleaning versatility, safety features, and from a reputable brand. Surely, you’ll get the most of your money when buying this cold water pressure washer! What do you think of my recommendation? Let me know and comment down below!! www.pressurewashersdirect.com for relevant information about cold water pressure washer, as well as for the detailed specs of Simpson Cleaning MS60763 and Excell EPW2123100. www.pressurewasherinsight.com for the detailed information of Wen PW31. www.duromaxpower.com for the features and specifications of DuroMax XP2700PWS. www.consumerreports.org for authentic feedback and reviews from customers.